At the time of writing this blog, there are 378 days, 8 hours until the GDPR comes into force. That’s 54 weeks or approximately 270 weekdays, not considering public holidays. Surely plenty of time to get everything in place and ensure your business is compliant. Right? Let me back this up by putting some context around the various elements discussed in the previous blogs in this series. Something covered in Part 2 of this series. We can use the timeline as a guide and look at the task involved in each phase. We aren’t going to patronise you and outline how a project should be managed. We assume that you have all been involved in some capacity or other in a business wide project. What we do ask is to remember the time, effort and challenges faced to get even the simple tasks completed. None of this is unique to GDPR of course, but it should be a timely reminder of how tricky a project can be. Where most project like to state a fixed deadline, that’s often not strictly the case and frequently those deadlines slip. Very few organisations will have an end-to-end data handling process compliant with GDPR – and that’s before you consider consent, DSARs and the right to be forgotten. Those efficient processes you have used for years may have to be completely revised. No small task. Designing and testing the change. Implementing the change. Training the staff to work the change. Now there’s a challenge! You may have noticed the lack of DPO chat in these blogs. That’s for good reason – it’s not an area STEALTHbits can help you with. However, it’s certainly one of the most critical elements if you come under the scope of requiring one. Do you need a DPO? Do you have someone suitable? What does a DPO do? They certainly won’t be a cheap resource…even more expensive given the shortage of experienced security personnel out there. We can’t have a GDPR blog without mentioning the fines at least briefly. (for more information, please refer to part 1). The numbers are simply too large to ignore and ignorance is no excuse. However, it’s not just the fine for non-compliance that you need to worry about. If there is a data breach involving personal data, if you can’t prove ‘privacy by design and default’, not only will you get hit with a GDPR fine but the Data Subject themselves will also have a case to take personal litigation action. These fines could dwarf and official fine and potential bankrupt an organisation. Look at Amazon and the affect the well publicised breach had on their share value. GDPR related breaches and fines will be big news. Add together these factors and non-compliance could bankrupt an organisation. We’ve taken a high-level look at GDPR, the well publicised elements and some that aren’t immediately obvious. We’ve highlighted who you should be working with and to what ends. We’ve looked at the potential financial repercussions of not addressing GDPR – and soon. I hope we have helped de-mystify some of the unknowns and given you clear direction and focus. The EU GDPR is, without doubt, the future of Data Protection legislation, whether you are in the EU or not. Brexit or not. Expect other territories to follow suit and tighten up their regulations. Don’t be a GDPR test case and headline. Do call your STEALTHbits rep and we can help you on your path to GDPR compliance. Mark Wilson is a Director of Product Management at STEALTHbits Technologies. He is lead Pre-Sales consultant in the EMEA region and a key member of the global Product Marketing team. 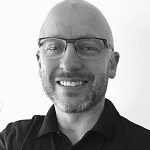 Mark has 18 years’ experience working in virtually all technical support and consulting roles across both public and private sectors in the UK, EMEA and Globally. Areas of specialism include compliance, data governance, IAM, migrations and consolidations.